Makita SK104Z Self-Leveling Horizontal/Vertical Cross-Line Laser. Self-Leveling Horizontal/Vertical Cross-Line Laser. Durably designed, this Self-Leveling Horizontal/Vertical Cross-Line Laser (SK104Z) is a reliable layout tool for plumbing up and alignment tasks. It has a line visibility range of up to 50′ and a point visibility range up to 100′ depending on ambient light in working environment. The impressively fast self-leveling time (stability is achieved in 3 seconds) decreases down time on the work site and in turn increases productivity. It’s also dust and water resistant. Plus, it delivers up to 35 hours of continuous run time operation. Line visibility range up to 50′ and point visibility range up to 100′ depending on ambient light in working environment. Fast self-leveling time; stability is achieved in 3 seconds for increased productivity. Self-leveling is correctable up to 4° of slope allowing operation on uneven surfaces. Bright 635 nm class II laser for best-in-class visibility in moderate ambient light environment. Laser line fan length spans well past 90° point position to provide 180° horizontal line and 120° vertical line for full reference line coverage in demanding applications. Integrated pendulum lock enables slope incline applications for increased versatility. Pulse mode allows operation with laser receiver with detection achieved up to 200. Pulse mode conserves and extends battery life for increased operation time in low light environments. Delivers up to 35 hours of continuous run time operation. 3 dedicated mode functions conserve power by allowing battery power usage only when needed to operate the necessary functions. Recessed laser windows are highly protected from fracture damage in slot positions for increased durability. Full over-sized rubber over-mold for increased protection. Pendulum lock offers added protection of laser diode during transport and storage. Simplified two button user interface for ease of operation. Multi-purpose magnetic bracket allows for attachment to a tripod with a 1/4″ and 5/8″ thread or to metal and wood objects. Point Beam Direction: 4 Point (Up, Down, Left, Right). Line Beam Direction: 2 Line (Horizontal, Vertical). Laser Diode: 635 nm, Class II. Working Range (Line): 50 Feet. Working Range (Point): 100 Feet. Line Accuracy (at 30′): +/- 1/8 Inch. Leveling Range: 4 Degrees. Power supply (AA battery): 3. Operating Time: 35 Hours. Operating Temperature: 14 to 102 Degrees Fahrenheit. Storage Temperature: 0 to 158 Degrees Fahrenheit. One (1) Self-Leveling Horizontal/Vertical Cross-Line Laser. If an item ships for free to a commercial address it will be noted on the product page. If the item is opened or has been used we reserve the right to refuse return. Toolbarn has been an online tool superstore since 1998. You may also be interested in.. View more great items. 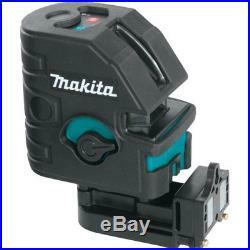 The item “Makita SK104Z Self-Leveling Horizontal/Vertical Cross-Line Laser” is in sale since Tuesday, February 28, 2017. This item is in the category “Home & Garden\Tools & Workshop Equipment\Measuring & Layout Tools\Laser Measuring Tools”. The seller is “toolbarn” and is located in Carter Lake, Iowa. This item can be shipped to United States.